The CGBSE (Chhattisgarh Board of Secondary Education) 10th class results were declared on Friday, April 21st, 2017. The results were released by the Chhattisgarh education minister Kedar Kashyap. Chetan Agrawal from Kiran Public HS School, Kurud, Dhamtari is the topper (98.17%) of CGBSE 10th examination 2017. The results are available on the official CGBSE websites, web.cgbse.net and cgbse.nic.in from 10.00 AM. Students need to enter the date of birth and roll number for getting the results online. More than 4.5 lakh candidates have appeared for the CGBSE 10th examination 2017. The CGBSE 10th examinations were conducted from 10th February to 2nd March 2017. There are chances of getting the results sites gets hanged as a result of massive traffic so that the board will be publishing the results through alternative sites (web.cgbse.net and cgbse.nic.in). Th results can be checked through Smartphones, tablets or any other smart devices. Students can take printouts from the site once results are published. The 10th class plays a significant role in a students career, so ever student will be eagerly waiting for the results. The results of Chhattisgarh 12th class results are expected after one week. The results of last year’s CGBSE 10th class were declared on April 28th, 2016, and the total pass percentage was 55.32%. Check out the steps for checking the CGBSE 10th result 2017 online below. Step 1: Enter the official CGBSE websites cgbse.nic.in or web.cgbse.net. 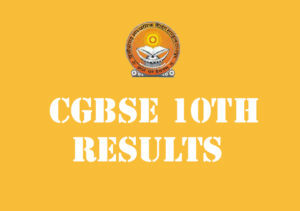 Step 2: Click on the CGBSE 10th result 2017 link. Note: There are chances of getting the site down as there will be huge traffic. So check the sites repeatedly after 10.00 AM. Best of Luck for all the students who appeared for the CGBSE 10th Class Examination.